Tonight I noticed two options in my Gmail account I hadn’t seen before – Contact Suggestions and Chat Invitations. I am not sure which Google product beyond Gmail generated the contact suggestions and chat invitations, however none of the suggestions appeared relevant or actionable. 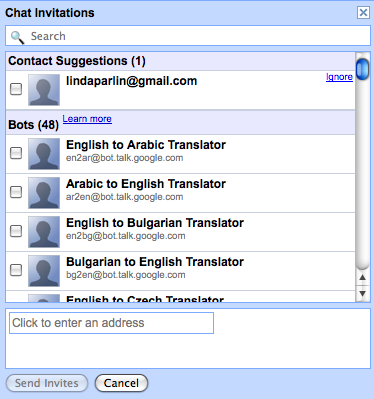 Nor do I know why Google suggests I enter into chats with any of the 48 “Bots” listed below. Once I left my Gmail account, I wasn’t able to generate either the Contact Suggestions or Gmail Chat Invitations screens again. This entry was posted on January 29, 2011 at 10:53 pm and is filed under Gmail Chat Invitations, Gmail Contact Suggestions. You can follow any responses to this entry through the RSS 2.0 feed. You can leave a response, or trackback from your own site.